As for modern technologies used, Ap StanSmith supports CSS3, HTML 5, RTL language and Bootstrap 3 framework that helps create a refined web page with semantic accuracy. It is also an optimum combination of so many other special modules, Slideshow, Blog and Mega Menu, for example. Finally, Ap StanSmith Prestashop theme comes with an awesome built-in admin back-end dashboard, which will help you manage your site better and customize easier. - Support responsive design: 100% fully responsive for all most popular screen solutions. It is tested on many smartphones such as iPhone, Samsung, Nokia, etc. It is designed based on the most popular web and mobile standards so customers can easily access their online stores via mobile. - Theme installation package: This Package is packed with All Modules, Templates, Userguide, DataSameple. By using this package, you will get your site to look like the demo. 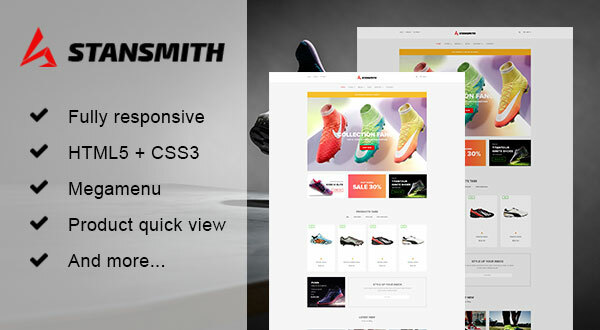 - PSD Sources: All our templates are delivered with source Adobe. PSD files. - Included Extension Packages: You can get All of the Template, Modules, Plugins... which we use for the demo.